Eastwood City and Etihad Airways gives you a chance to travel AROUND THE WORLD! 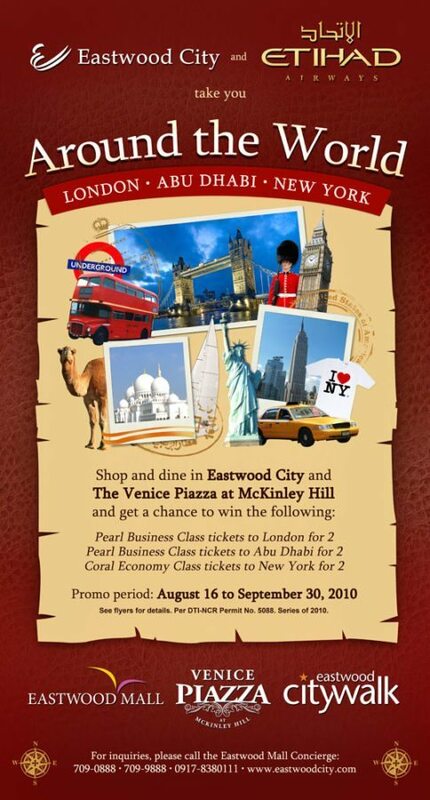 Shop and dine at Eastwood City or Venice Piazza at McKinley Hill and get a chance to win the following: Pearl Business Class tickets to London, Pearl Business Class tickets to Aby Dhabi or Coral Economy Class tickets to New York! Promo period is from August 16 to September 30, 2010. 1. The promotion is open to all Eastwood Mall, Citywalk I & II, Cybermall and The Venice Piazza customers. Promo period is from August 16 to September 30, 2010. A maximum of fifty (50) coupons will be given to every customer per day regardless of the amount of receipts presented. Receipts from account payments, short term lessees and gym memberships are not qualified for redemption. Customers must fill out the raffle coupon with their complete name, complete address, contact number and affix signature to qualify as a valid entry. Drop the raffle stub at the designated and marked drop box located at the locations mentioned above. Deadline for the dropping of all raffle stubs is at 12MN on September 30, 2010. Late entries will not be accepted. All prizes are transferable but not convertible to cash. The 20% tax for prizes exceeding P10,000.00 shall be shouldered by the winner. All travel documents (i.e. VISA, Passport) and travel tax and travel related expenses such as terminal fees, excess baggage fees, etc… shall be shouldered by the winners. Raffle draw will be held at the Megaworld Commercial Division Office in the presence of representatives from ETIHAD Airways, Megaworld –Commercial Property Division and DTI on October 1, 2010 at 6:00p.m. Customers may win only once. If a customer’s name is drawn more than once, the customer gets the prize with a higher value. Winners will be notified thru telephone call and registered mail on how to claim their prize. Winners may claim their prize within 60 days from receipt of notification. All trips must be completed on or before June 1, 2011. No extensions will be granted. Winners must coordinate with Etihad Airways for bookings and reservations. Re-booking and change of destination will not be allowed. Failure to claim prizes after 60 days from notification will mean the automatic forfeiture of the prize in favor of Megaworld Commercial Division with the prior approval of DTI. All decisions made by Etihad Airways and Megaworld – Commercial Property Division, with the concurrence of DTI, will be final and irrevocable. The owners, management, employees of Etihad Airways and Megaworld –Commercial Property Division, First Oceanic Realty, Eastwood City Estates Association, Eastwood Property Holdings Inc. and all Eastwood City tenants, their advertising agencies, spouses and relatives up to the 2nd degree of consanguinity or affinity are disqualified from joining this promo.